Here we are at the last stop of the tour – Princeton. 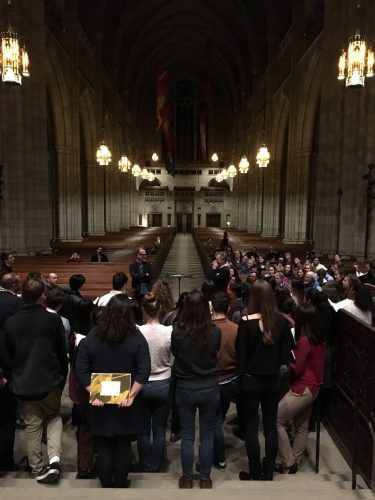 Our visit here began with an evening workshop on the 4th movement of Path of Miracles with the Princeton Glee Club – the stunning choir now run by Gabriel Crouch who has been singing with us on the tour. PGC impressed us all immensely with their mastery of the challenges of the piece, which they had enjoyed performing in concert recently; it’s hard to imagine many student choirs accomplishing this challenge with such distinction. We heard them tackle some of it alone; Nigel used Tenebrae to illustrate a couple of things, both as an ensemble and even singling out parts. The effect of this as a teaching tool was very good indeed to watch and hear. The session finished with a run of the last movement, including the choreography, which was thrilling. For us to be able to leave a small legacy for such talented students to work with in the future is an absolute treat. It was also great fun to spot that there are a couple of things which we are used to now, but which clearly have considerable wow power for the uninitiated – most notably the ear shattering experience of the Budd/Madden tenor duo smashing out the long top B’s at the opening of the piece, and later the shock of Jimmy blasting out the word “Santiagu” at point blank range into the backs of the heads of the unsuspecting students right in front of him. This piece has the power to surprise and shock at every turn! It is also terrific for all of us to have Joby Talbot here for this performance – however professional one always tries to be, having the composer in the room always forces one to dig a little deeper. The reaction of the onlookers at the session was great to see too – a number of them commenting how keen they are to get back this evening to hear the whole work in the concert. Word on the street has it that the chapel will be absolutely full later, and also will include some very big names in the music field on this side of the country, from Philadelphia to Boston. It feels as if it’s going to be the perfect way and the perfect place to finish the tour, before heading back to the UK tomorrow. Finishing a tour is a rather odd business. The team has been in each others’ pockets for over a week, endured half a dozen flights or more, looked at different hotel rooms on a mostly daily basis, and yet pulled repeatedly excellent singing and ensemble work out of the bag on every occasion. The intensity of all of this becomes a bubble of high pressure and emotion which, when the tour ends will burst and exist no more. Back at home, we know we will all feel a bump back into whatever is next in our various diaries because we’ve all toured before. But I wager that all of my colleagues will admit to expecting a slightly bigger bump than usual, such has been the power of the effect of this extraordinary work on the huge number of people who have heard it over the last week. That number will increase by another thousand this evening. On a personal note, as the last standing founder member of the group, perhaps it falls on me to thank Nigel on behalf of all of us for his extraordinary contribution to this trip. If, as they have told us, we have changed the lives of some of our audience, then it is he who singlehandedly has enabled us to do that by bringing us together for this great journey through Path of Miracles. As the group heads home, and I break ranks and fly up to Chicago, I know I shall think about that more than once on the journey.